What a Knight for hockey! Sun Valley’s Knight family was in the house as the Sun Valley Suns men’s hockey team did a number on the visiting Rebels of Salt Lake City, Utah, by a 6-2 score Saturday night. The family of James and Cynthia Knight has made Sun Valley its primary residence since their move from New Hampshire in 2009. But American women’s hockey star and eldest child Hilary Knight has been busy with hockey assignments over the last four years. Hilary Knight, 23 and a graduate of the University of Wisconsin, thoroughly enjoyed her two evenings of watching younger brothers William and Jamie play for the Suns against the Rebels last weekend during the Christmas holiday in Idaho. Jamie Knight, 21, scored two goals in Saturday’s 6-2 victory, which swept the two-game weekend series and evened the Suns’ season record at 3-3. Two-time Suns scoring champion Bryan O’Connell added two goals to go with single scores by Justin Taylor (6 weekend points) and Rob Morgus (3 assists). Then, on Wednesday night on resort ice, William Knight, 18, scored the game-winning goal for the Suns in the annual exhibition game against the Future Suns that raised money for Sun Valley Youth Hockey’s Brett Sammis Scholarship Fund. The Suns prevailed 5-4. Goals by Future Suns captain Tom Crosby and Jimmy Hague rallied the underdogs from a 4-2 deficit into a 4-4 tie before William Knight’s winner with five minutes left. Also scoring for the Suns were John Miller (2), Bryan O’Connell and Jamie Knight. Zak Sjoberg and Liam Jablonski had Future goals. For the record, Hilary Knight ended her four-year collegiate career as the senior captain for the Wisconsin Badgers last March with a school record 143 goals and 119 assists for 262 points. 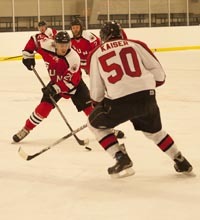 The Badger captain had 30 game winners, as well as 37 power-play and nine shorthanded career goals. In addition, Knight was a member of U.S. Women’s National Teams that captured three consecutive gold medals in the International Ice Hockey Federation (IIHF) world championships from 2009 to 2011. She scored the overtime game winner in America’s gold medal victory over Canada in 2011 at Zurich, and also led Wisconsin to the 2011 NCAA national title. Next for the Suns: The Jackson Hole (Wyo.) Moose are the Suns’ guests for a big New Year’s weekend series Dec. 28-29 at Sun Valley Skating Center. Opening faceoffs are 7 p.m. today and Saturday, benefiting Sun Valley Adaptive Sports. FIRST PERIOD—(1) SV, Bryan O’Connell 3 (Jon Duval, Ryan Enrico), 2:34. (2) SV, Duval 4 (Enrico, Danny Ward), 11:12, power play goal. (3) SV, Charles Friedman 1 (Rob Morgus), 11:45. (4) Rebels of Salt Lake, Phil MacDonald (Weston Nash, Todd Potemba), 16:23, power play goal. (5) Rebels of Salt Lake, Brawnson Holtkamp (Brandon Henricksen, Tim Monell), 19:26. SECOND PERIOD—(6) SV, Enrico 1 (O’Connell, Justin Taylor), 4:54. (7) SV, John Miller 1 (Jamie Ellison, Ward), 7:46. (8) SV, Taylor 1 (Enrico, Ivars Muzis), 18:08. THIRD PERIOD—(9) SV, O’Connell 4 (Duval, Taylor), 1:02. (10) SV, Ellison 1 (Duval, Taylor Rothgeb), 3:35. (11) SV, O’Connell 5 (Enrico, Taylor), 4:25, hat trick goal. (12) Rebels of Salt Lake, Monell (Johnny Vance), 14:39. (13) SV, Enrico 2 (Duval), 18:14. SHOTS ON GOAL—Rebels of Salt Lake 7-5-4 for 16; Sun Valley 14-10-9 for 33. GOALIES—Rebels of Salt Lake, Travis Pierce (23 saves); Sun Valley, Cody Levitan (13 saves, 2-2-0 record). OFFICIALS—Dave Patrie and Chris Benson. NOTES—Suns forward lines featured Ryan Enrico-Jon Duval/Justin Taylor-Bryan O’Connell, Taylor Rothgeb/Zak Greenawalt-Jamie Ellison-Chad Levitan, and Rob Morgus-Charles Friedman-William Knight. FIRST PERIOD—(1) SV, Justin Taylor 2 (John Miller, Ivars Muzis), 1:31. (2) Rebels of Salt Lake, Weston Nash (Rustin Hocker), 7:12. (3) Rebels of Salt Lake, Tim Monell (Nash, Hocker), 9:46, power play goal. SECOND PERIOD—(4) SV, Jamie Knight 1 (Rob Morgus, John Stevens), 14:35. (5) SV, Bryan O’Connell 6 (unassisted), 14:40. THIRD PERIOD—(6) SV, Morgus 1 (Charles Friedman, Taylor), 8:41. (7) SV, Jamie Knight 2 (Morgus, Stevens), 17:18. (8) SV, O’Connell 7 (Morgus, Jon Duval), 18:08. SHOTS ON GOAL—Rebels of Salt Lake 9-7-5 for 21; Sun Valley 18-14-20 for 52. GOALIES—Rebels of Salt Lake, Travis Pierce (46 saves); Sun Valley, Cody Levitan (19 saves, 3-2-0 record). OFFICIALS—Chris Benson and John Heinrich.